Before diving into creating your own ribbon you should know the following distinction. In Office 2010 it is possible to create your own tabs in the ribbon by using the [Customize Ribbon] under the file options in the specified application. For Excel, PowerPoint and Word you can create file based ribbons with the customUI editor. This is not possible for Microsoft Access. For Access there are other options which we will describe later. So the first thing you have to know is do I want to customize my ribbon used by the application or do you want to create a ribbon which is attached to the file (project) you are working on. Let us take a look at the first option. In this scenario you are creating a new Tab in your exsisting application ribbon. This tab will show up every time you start your application like for instance Excel. You can simply create your own tabs by using the [customize ribbon] under the File – Options. In the picture you will see that I created a new tab called “Maurice” with one button on it the “Name Manager” in Excel. Now for the last part that got me confused. I would have expected a button with [New Button] but there is not. You can now go to the left part of the screen and just ‘drag’ the options you like to your own tab and group. The nice thing is I dragged the ‘name manager’ option and this button actually works without me doing any programming at all! To remove the various options in your tab or remove the tab as a whole one might expect a [Delete Button]. You will not find it. Rightclick on your tab (or group or buttons) and choose remove. This will make your tab disappear forever. 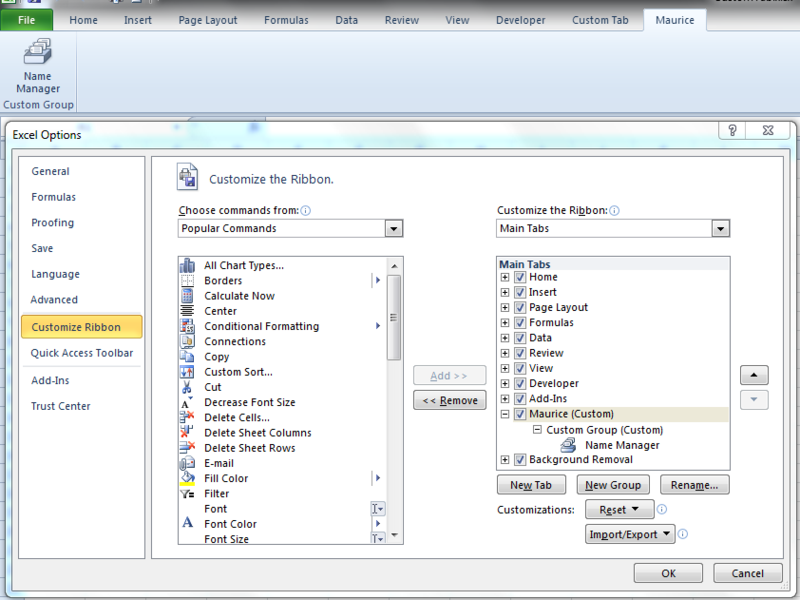 If you want to add your own ribbon to a specific file you can not use the [customize ribbon] option in the application. At that point you need to write either your own .xml or use a tool for this. That is where the CustomUI Editor comes in. – First you have to make a decision whether you want to make a tab for Office 2007 or Office 2010. You do so by clicking on the Insert option in the menubar. For the example I chose the Office 2010 option. You still have a blank window but an indicator on the left has shown up indicating that this is 2010 xml markup. In the picture I posted here you will see that the actual xml is created in an earlier version of Office namely 2007. This code will work in 2010 as well the only downside is that you can not make any customizations the the Backstage View of you Ribbon. To do so you need to set a reference to the 2010 schema which is: [http://schemas.microsoft.com/office/2009/07/customui] without the brackets! But as I stated the xml in the picture does work with Office 2010 as well because we are just adding a Ribbon with one tabe to the file. In the picture you will see the XML markup which will make up the tab in the example file. Let me explain a little more about that. The first lines you see are mandatory. They describe the schema used by xml. Furthermore every line starts with <> and should be closed with its counterpart which is </> which closes the set of references. So if you look closely you will see that the first reference is <ribbon> which should have a counterpart </ribbon> which closes the reference. It might be an option to create a template with the first three lines because you will use those for every xml part. Write them down and paste them into a notepad text file for later use. The last option is optional and can be left out. When you are done click the save button in the UI Editor. Your xml is now attached to your file. Changes can be made by opening the UI Editor again en opening the specified file. So go ahead and let’s see what you can do. Download the UI Editor and start creating your own tabs! use the first few lines from the sample above and you are good to go. Run Windows Update, and in Optional Updates pick .NET framework 2 or 3. After you installed it, run Windows Update again to see if there are patches for it. and/or a customUI14.xml file only for Excel 2010 into your 2007-2010 workbook. But if you want to insert (for example) a button in the Office Button menu when you open your file in Excel 2007 and a button in Backstage View when you open the workbook in Excel 2010, then you must insert the RibbonX in both the xml files with the Custum UI Editor. This entry was posted in Toolbox and tagged CustomUI;Ribbon, Step by step Customui editor, Tutorial CustomUI on June 22, 2011 by Maurice. Pingback: What else can I protect?